Click on the map above to go to Mapquest and determine your distance from 1801 E. 86th Street, Indianapolis, IN 46240. If you are 20 miles or closer, there is no travel charge. Anything more than 20 miles away will incur a travel charge of $0.58 per mile round trip. Don't get caught unprepared for battle! Visit our online store today! Email Steve (steve@romanspersonas.com) to see if the date you would like is available. Be sure to include your name, location, requested date, requested time, and along with audience size and make-up (e.g., high school students, middle school students, adults, etc.) Please be aware that the Vergil persona is available only to groups of no more than 30. Respond to follow-up email from Steve. 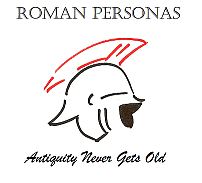 Now you are ready to step back in time and watch antiquity come to life! You must provide a place for Steve to change into costume once he arrives at your venue. Please use the Mapquest link to determine potential travel cost. Copyright © 2011 Steven R. Perkins. All Rights Reserved.